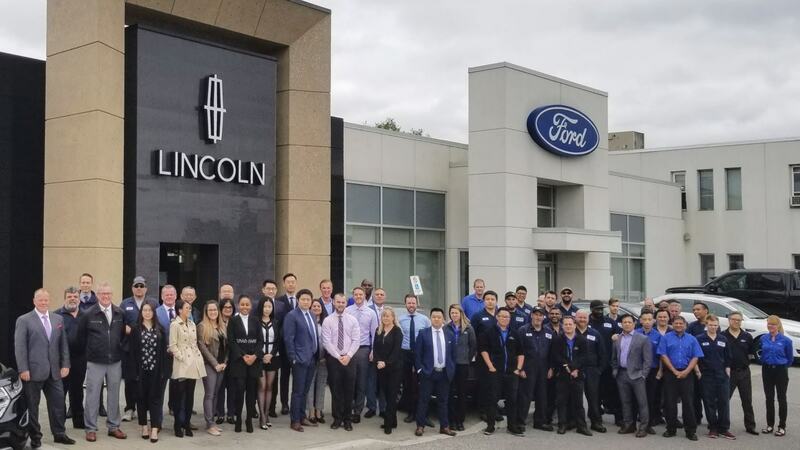 Markville Ford Lincoln has been serving Markham, and the surrounding areas, for over 25 years. Markville Ford is the proud recipient of Ford’s “Diamond Club” award; Ford’s top recognition award for the “best of the best” in sales and customer service these past 4 years. We are committed to providing a superior purchase and service experience with each and every customer, every time. We achieve this through highly skilled, dedicated professionals who take pride in making this experience a reality; resulting in a customer for life. As a Ford and Lincoln dealer, we proudly offer a superior selection of top quality vehicles, both new and pre-owned. Our customers are very important to us and we firmly believe that the car shopping process should be straight forward and fun. Our dedicated sales staff is complimented by our certified service technicians. Our team will handle any needs, you or your vehicle may have. We hope you will enjoy our complimentary customer shuttle, free Wi-Fi, and our friendly and dedicated staff. Please ask about our programs for those new to the country, including international students (work permit or student visa). All credit situations welcomed! Our team of experts work with a wide variety of financial institutions. We will sit down with you one-on-one to find the best financing packages available. Whether you’re looking for fuel economy, comfort, performance, or something just for your weekend enjoyment, Markville Ford Lincoln strives to provide you with the vehicle you want, and the service you expect. Come and be a part of the experience and see for yourself why our customers remain loyal to us for years.